The sun batik and the Asian print at the bottom were laying near each other in my stack of fabric, calling out to be used together. I pondered what to do with them for several days and decided that sometimes the fabric wants to be the star and you don’t want to cut them up. Still they needed some piecing to make them spark. 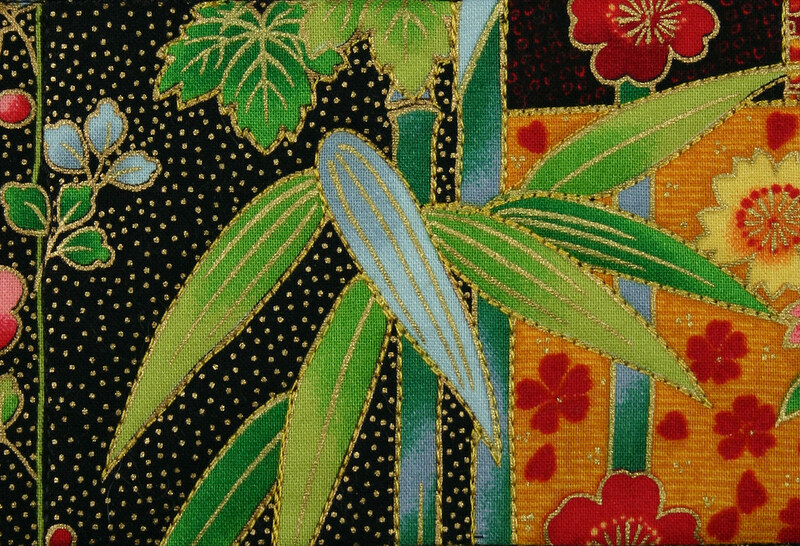 I tracked down the feather and crane prints and then used the flower colors in all the fabric to pull batiks for the multi colored bands. The bands tie all the other pieces together. Add a little black to outline the bands and sections and it was ready to quilt. For the quilting I chose to leave my feed dogs up and use a straight stitch. 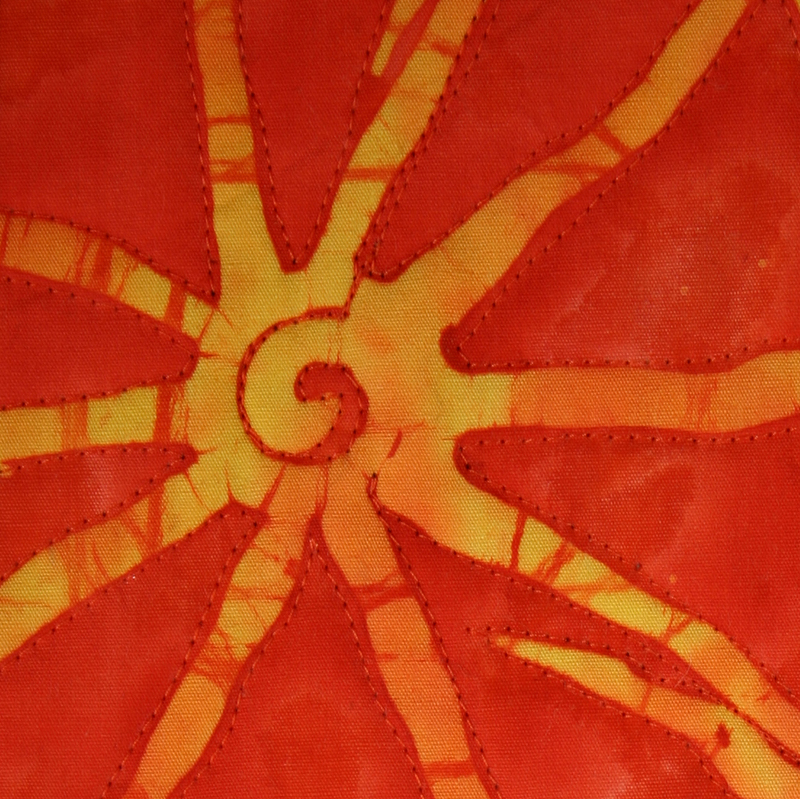 In addition to background stitching and stitching in the ditch, I outlined the suns in the batik and the bamboo. I think “Summer Sizzle” turned out quite nicely for a simple design. 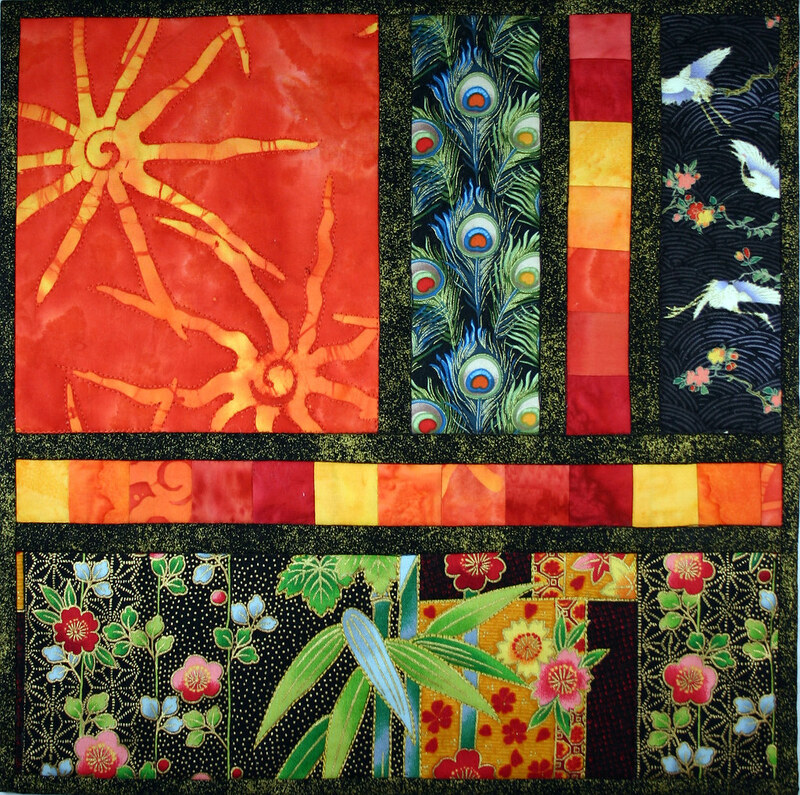 For more info: Twitter quilts…….Twilts or see all my Twilts : Flickr Twilts Page. This quilt is absolutely stunning! OMG I want to make one NOW! Too bad I have other stuff to do:( I have a black and white with red accents planned and a TON of cowboy/Indian/western fabrics I really need to use up. Our quilt guild is doing a tropical challenge though hmmmmmm. Wow what a stunning summer sizzler! I love the way you come up with something completely different each week, they are always fabulous, and I always want to have made them!! This whole Twilt project has been an interesting journey. I have no idea where I will go with it. Should I write a book about them, do patterns or something else. I have even been asked if I will sell them. What I do know is that I have made a committment to do one every Tuesday and other than my last road trip, I have. It is a creative challenge and an opportunity to put fabrics and ideas together in new ways. It is a deadline and for me deadlines are helpful. I am so glad everyone is enjoying them and look forward to where they will take me in the future. You know, at the end of a year I should have 50. Yikes! Shelly – your twilts are stunning. Please think about having an exhibit somewhere so we may see how beautiful they are in person and inspiring.